Nate Michaels is a Freelance Artist based in Louisville, Kentucky. He was raised on Art and Rock and Roll, spending his younger years gigging in rock bands and traveling the midwest. As his collection of art began to grow, his music tours turned into a journey of visual art. Now you can find Nate traveling all over the country on his “Livin’ In Color” Tour. Sharing his art and making his mark in the world. 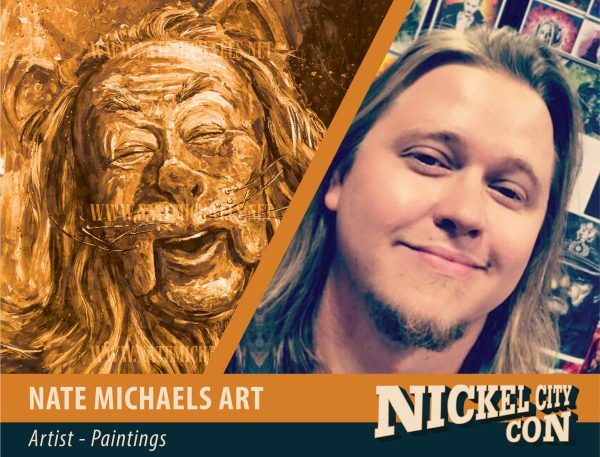 Nate brings life to the eyes of his portraits with an exuberant use of watercolor and India ink, while his more recent ventures have brought him to the endless valleys and crests of acrylic and the gentle slick kiss of oils. Most of his art speaks for itself as you can see the time and effort within each mark, stroke or medium. His history in music and love for the stage has bled through into some of his earlier pieces, as you can find many legends in rock. While appeasing the elder generations, Nate Michaels also brought a link to the super hero world with a real feel. Creating pieces that can be appreciated by any age. In this day and age having an artist who works with his hands and real materials isn’t around every corner. This rising artist is a genuine talent.